Phra Paisal Phra Paisal Visalo, a thinker, writer and dhamma practitioner who is a member of the committee on national reform led by Anand Panyarachun, shares his views about the rifts in Thai society. 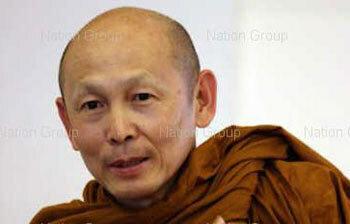 He also advises how to deal with the problems, and proposes ways to bring Thailand back to peace. Q: It seems that the problem of double standards is everywhere. A: Yes, it's in Thai culture. Thai people are cultivated to be self-centred. It's not fair as long as we get a lower salary or bonus. It's fine if we get more than others and it's needless to talk about fairness. In Buddhism, this is called "autocracy" not "Dharmacracy". Dharmacracy is focusing on dharma, the righteousness. Although I'm disadvantaged, it's ok because it's the right thing. And it's not ok although I'm advantaged. Is it too pessimistic to say that Thai society is now an autocratic society? I strongly believe so. (stressing his voice) Although we claim fabulous reasons, they are only for personal or our group's interest. For example, corruption is bad. But many red shirts say it's ok if Thaksin corrupts and uses the money to help the poor. That's a double standard. What dharma principles should be applied to deal with an autocratic society and the changing world society? Many. Firstly, you have to think of others more. People in Thai society now only think of themselves. Thinking of others more is like what Adam Kahane (writer of "Power and Love: A Theory and Practice of Social Change" who came to promote a Thai version of his book recently) says. Distribute love to others more, and that will help reduce conflicts. But sharing love is not enough. You have to share the power. Love without any action is useless. Love and money-giving only, or populism, is no way to solve problems. Now all sides are saying they are doing it for the sake of the country. But their definitions are different. Some people say it will be a complete democracy when power is in the hands of those who come [to power] from elections. Others say government officials and the justice system must make the balance. When conflicts occur, talks are needed. But there was no platform for the red shirts, then they rallied. Therefore, not only love and power |sharing, stages for negotiation are crucial. We cannot end the problems with force but with rational talks. How can rational talk be possible? It seems difficult so far. Firstly, trust is crucial. There was no trust among the parties involved, neither the red shirts nor Abhisit (Vejjajiva- the prime minister). It might have been because of the lessons in the past, and they would not give another chance. On May 19, the government said the red shirts did not disperse as promised, the red shirts said the government did not really reconcile as there was no progress from the events of April 10. Trust must be created. It could be started with a simple condition such as no movement over a week. If that does not happen, distrust continues. But if it goes well as promised, trust is gained initially. Then the red shirts might get some time on NBT and the red shirt's TV stops attacking the government, that happening would test and create trust gradually. The cease-fire agreement works like this. First one week, then one month and then talks on bigger issues can happen. Yes. But at the end of the day, both sides need to talk. (South African presidents) Mandela and Willem de Klerk did not trust each other in the first place. Mandela went to see Willem de Klerk at Government House and they barely talked. For the second time, Willem de Klerk visited Mandela in prison. They talked for half an hour. After that, Mandela wrote in his diary that Willem de Klerk listened to what he needed to say attentively, and he (de Klerk) was someone he could work with. Meanwhile, Willem de Klerk told his party members and the Cabinet Mandela had paid attention to what he said, and was someone he could work with. They talked accordingly. That was the beginning of their talks. Finally they achieved agreement which led to an election. It took two-three years before that. Trust must be created through meeting personally. If people can meet without having to hold their "" role, they can see the humanity in each other, then doubts and hatred decrease. The problem is everybody is sticking to themselves? There must be breaking of the ice. The mediator must do this. When Carter (James Earl "Jimmy" Carter Jr- former US president) set a talk for Menachem Wolfovich Begin (the first Israeli prime minister) and Muhammad Anwar al-Sadat (then Egyptian president) in Camp David in a peace talk to end 30 years of war, the atmosphere there allowed privacy and they began to set aside their positions so they could understand each other. If the talk had been held officially, they would stuck to their [own] positions and could not talk openly. They would not have seen the good side of each other. In my opinion, talks might not be the issue now. All sides must first send a signal they want to talk. Now it doesn't seem like that. Both the State of Emergency and the red-shirts' movement remain. Do you mean both sides are too extreme at the moment? Yes. Bloodshed really rubbed salt into the wounds and complicated the situation more. Is autocracy the root of all problems? Partly. Like I said, all problems occurred amid Thai society's changing, not to mention the world's. The gaps between groups are wider while each group is divided into smaller ones. People can be very different, even among the middle class.Globalisation might also share some responsibility. It led to a society of advantage taking over, the war over natural resources and more monopoly. The lower middle class and the lower class cannot take it anymore. So they have to stand up and fight for change. On the other hand, those in advantageous positions don't want change. To be straight, the red shirts want change while the yellow shirts and those in power don't. I cannot say whether what they are calling for can really lead to change. How long do you think these conflicts will last? In the past, it depended so much on the leader such as King Rama V. General Prem (Tinsulanonda- Privy Council president and former prime minister) tried to end the war between communists and the government. The killing continued for almost 20 years before it ended. Actually Thai society started to change about 10 years ago, but nobody realised the problem. Some might have been aware and begun to talk about disparity and injustice. But most of the middle class who are in advantageous positions did not. This needs a brave leader. Civil war in South Africa was prevented with the bravery of Mandela and de Klerk. But the leaders cannot do it alone. They need society's support.The problem now is the power holder, those in advantageous positions fear the changes. For example, they feared that a free election would allow Thaksin to win. They have done a lot to attack Thaksin and fear being revenged. So they are in the mode of revenge and defence. Unfortunately, it's understandable that Abhisit is not the real powerholder. Unlike during the King Rama V era, which was absolute monarchy. So Abhisit cannot do much. Although he is brave, he cannot do much as he must compromise to the real powerholder. That might be some limitations. A: In my opinion it is the military. If the military threatened to stage a coup and I'm in Abhisit's place, I might have to think hard. A coup will ruin everything. For example, the military might give the choices whether to yield to the red shirts or a military coup.Actually there's no absolute power in Thailand nowadays. I just believe that if a clever man like Abhisit can find some allies, he might have enough power to push for the change although it's not what the powerholder needs. To what I know, Abhisit is not trying to find allies. The Democrats also complained. Pichai [former party leader Rattakul] complained that Abhisit has not sought his advice. Others in the party said Abhisit just mingles with his own group. I think Abhisit might have long vision, but he might be surrounded by the shortvisioned powerholders. He needs to draw allies like King Rama V did to balance the "old power clique". King Rama V found allies from the Siam Noom (Young Siam) group to balance the power with the old power clique of Somdet Chao Phraya Borom Maha Si Suriyawong [Chuang Bunnag]. He then gradually derived or drew the power from the Old Power Clique until the group lost its power. They underestimated the young king who took the throne since the age of 14 or 15. If Abhisit can draw allies like that, he will be able to create more concrete changes. Thai society needs changes. Thai society really needs change. It's in a very bad condition. Abhisit needs to be brave and go against the will of those people to facilitate the change. The red shirts are an accelerating factor. They won't tolerate anymore. How long do you think the country will take to get back in shape? In the past, change was resisted. Military coups hindered it. Although Thaksin hindered change, the military coup made it worse. It did not make any change but hindered change itself. How should people deal with conflict mentally? Firstly, they should understand the problem. They must understand that this is not conflict between persons, but it is the reflection of structural conflict. The root of the problems is injustice, unfairness, disparity, and insult against the poor or the rural people. All needs to be changed. Secondly, Thai society needs more patience and acceptance as well as respect for different opinions, the rights of expression for both the yellow shirts and the red shirts. Thirdly, Thai society needs mercy and compassion. Thai society is now at the point where everybody is a suffering victim. If we don't have mercy or compassion and love for one another, it will be more difficult. Now we should think of others more. In the past we thought of only ourselves and our groups. Leaders, politicians, government officials should care for others a lot more. rights for wrongdoers. No matter if they violate laws or morality, others can do anything to them. Rapists are scrummed to death, drug dealers are killed by police during arrests. It's like wrongdoers don't have any right even to live. The red shirts deserve death as they violated the laws.I think this is another problem that needs to be fixed. Wrongdoers deserve mercy. To what extent does private groups' campaigning- such as the Positive Network's - help? To some extent. At least they stop Thais from negative thinking, and then they are more hopeful. We should have many groups like this, but they should not work only on slogans. I would like to see these groups do something positive, not just think positively. They might do social activities or help the poor. Mobilisation like this would bring more hope to society. If they can help push for the structural change, that's great. As a member of the committee on national reform, outsiders might see the committee produced only abstract work. That's true, it's abstract. The committee hasn't produced any tangible thing. But it needs to prove itself.We have set a goal that in six months we have to be able to provide society something concrete. Two months has passed, we are still making understanding internally. We have tuned to some extent. This is not easy. The committee members come from various groups, some have the heart for the yellow shirts, some for the red shirts. In the meantime, in the past two months we have outlined our work. We stress creating fairness to reduce disparity. Creating fairness in five aspects including economic, resources, opportunity, negotiating power (bargaining power) and the rights. The next step is in-depth study to see what measures can be done urgently to create such fairness. What are difficult could wait until after the first six months. We cannot put our hope on the government to make the change. We must propose to society for mobilisation. Anand (Panyarachun- the committee chairman) said we will propose the plan to people and cc it to the government.